U.S. Portable Generators Market size in 2017 was valued over USD 1.2 billion and is set to exceed an annual shipment of 1.5 million units by 2024. U.S. portable generators market will witness an appreciable growth on account of increasing severity and frequency of weather-related disasters across the nation. According to the Edison Electric Institute, over 70% of electrical outages in the U.S. are caused as a result of weather related events. Natural disasters including hurricanes, wind storms, floods, tsunamis, earthquakes annihilate the critical power infrastructure resulting into prolonged power outages. Aging electrical infrastructure along with deteriorating grid resiliency will stimulate the U.S. portable generators market. The U.S. electrical infrastructure dates back to 1970s and is susceptible to frequent and unpredictable power failures. Increasing investments toward backup power solutions coupled with strengthening consumer awareness will further complement the industry outlook. 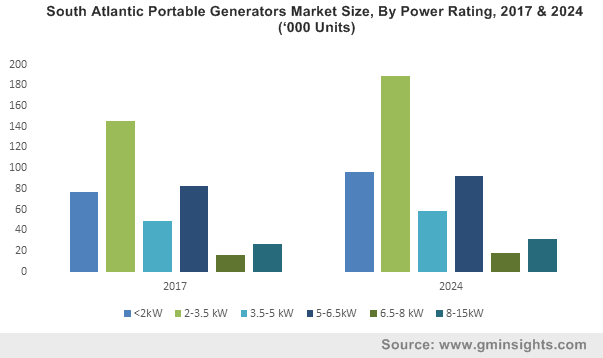 Escalating need for constant and reliable electricity supply along with growing consumer dependency on backup power solutions during unpredictable power outages will propel the U.S. portable generators market growth. Quick start-up, competitive prices, operational reliability and durability are some of the key features reinforcing the product demand. 2-3.5 kW power rating in 2017, accounted for over 30% of the U.S. portable generators market. Growing consumer affinity toward smaller and less powerful units on account of their affordable price index and easy portability will entail the sturdy deployment of these units. Light weight, compactness and operational suitability are the other vital parameters encouraging the use of these units. Increasing demand for dependable and constant power across construction sites will boost the demand for 8-15 kW generating systems. These units are primarily deployed across the work site and various industrial applications to efficiently power construction tools & equipment. Minimal operational and installation costs will further strengthen the product’s adoption. Class I engine portable generators market is predicted to expand over 4% by 2024. 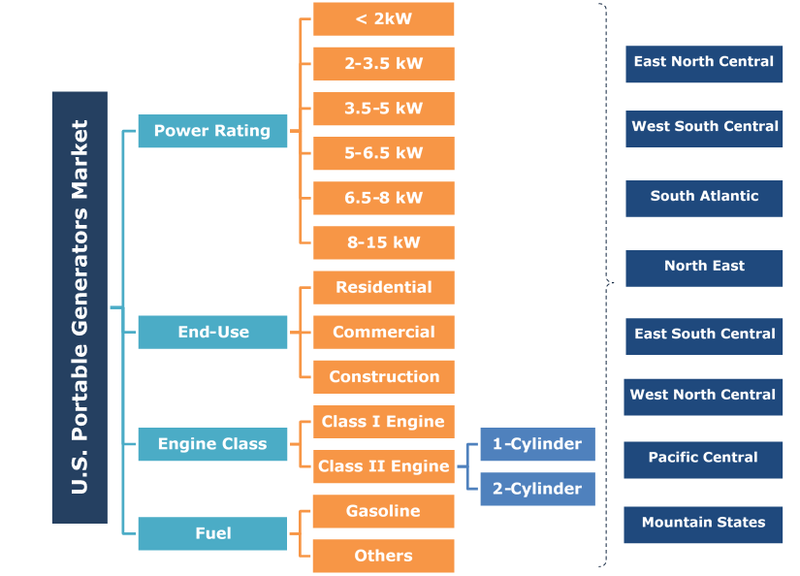 Competitive fuel prices, favourable capital structure and relatively safer operation will encourage the product deployment across the lower power ranges. However, increasing R&D investments to ensure compliance requirements with the emissions criteria is likely to increase the overall manufacturing costs of these units. Rapid technological advancements coupled with increasing stringency of regulatory compliances will drive the Class II engines portable generators market. Recent innovations including the development of twin cylinder technology which ensure minimized safety risks will significantly strengthen the industry outlook. Residential generator applications will grow subject to the increasing consumer demand for continuous and reliable power output along with growing dependency on power back-up units. Economic feasibility to fulfil low power requirements across the residential applications will further stimulate the demand for these units. Commercial portable generators market is predicted to grow over 3% by 2024. Sizeable investments in power backup solutions to circumvent the excessive productivity losses and revenue costs caused during power interruptions will positively influence the industry landscape. The product finds key applications across small commercial establishments. Gasoline portable generators market is anticipated to expand owing to its easy accessibility, affordable price index, and simple operation. Ability to offer handy and immediate backup power during extended electrical outages will further favour the industry growth. Other fuels including liquid propane and diesel are also used to power these portable units. South Atlantic portable generators market size is set to exceed an annual shipment of 400,000 units by 2024. Unpredictable power outages due to the Atlantic hurricane season and severe natural disasters will augment the industry growth. For instance, in 2017, Hurricane Irma struck Florida resulting into a severe power outage, affecting over 64% of all electric customer across the state. North East portable generators market is anticipated to expand over 5% by 2024. The region led by New York, New Jersey and Pennsylvania will witness an increased deployment of these products on account of prevalent severe weather and high economic growth. Burgeoning commercial and construction sector across the region will further favour the business scenario. Pacific Central market is predicted to grow on account of ever-increasing frequency of power failures and elevating electricity demand. The region, led by California experiences maximum number of outages amongst the U.S. states on account of intense weather conditions and unreliable grid infrastructure. Notable industry players include Cummins, Briggs & Stratton, Kohler, Generac, Yamaha Motor, Eaton, Yanmar, Honda Motor, Caterpillar, Honeywell, Kubota Atlas Copco, Siemens, John Deere and others. Price affordability, product differentiation, regulatory conformance, distribution & service network are some of the crucial strategic assets for an industry player to attain a competitive business position. The industry is further witnessing several mergers & acquisitions, thereby intensifying the market competition. The product is derived as an engine-driven equipment that convert chemical energy from the fuel to electrical power. The engine can be fuelled by gasoline, liquid propane, or diesel fuel. These units find prevalent applications across residential and commercial environments to provide backup power during electrical outages. Moreover, these are also employed across construction sites to consistently power job tools and equipment.